What programme should the Left advocate? 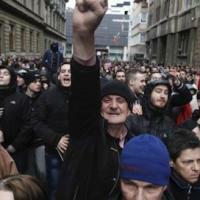 Five weeks have passed since militant protests broke out in Bosnia-Herzegovina. Sonja Grusch reports from her recent visit the country, along with other CWI supporters from Austria, where she discussed with protesters and Left activists. In Tuzla and other places, you can see the government buildings that were burned during demonstrations, when angry workers, youth and all those who want to stand up against the corrupt elite came together. Posters appeared, reading: “Death to nationalism” and “Thieves” and “Revolution”. The protests were “like an explosion after 20 years”, explained an activist we discussed with. Frustration and pessimism are present in all discussions. The unemployment rate varies by source. Officially it is over 40% but, in reality, it is much higher, reaching 70% in some regions. Out of a group of seven youth that we met in a town at the Serbian border, only one has a job. There is no milk for coffee, as it is too expensive. A man jokes (more or less) that women have to be glad to be able to afford cosmetic or sanitary products. For many young people, the only perspective for a decent future is to leave the country. The protests that broke out in February can change this view and people’s perspectives. 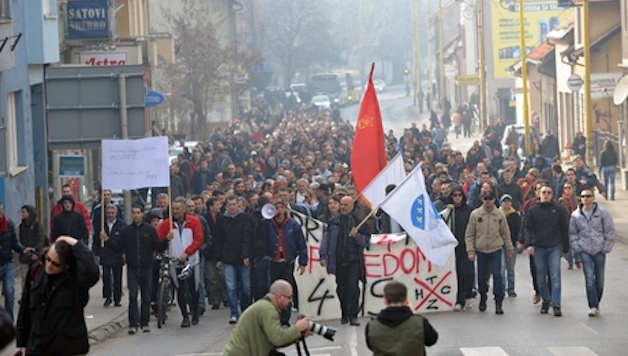 Unlike some other recent protests around the world, the working class has played an important role in the in Bosnia-Herzegovina actions from the beginning. There have been a number of workers’ protests over the last few years, mostly against the catastrophic effects of privatisation. “Criminal privatisation,” as it is often described, is an important factor for the protest movement. Stopping and reversing privatisation is one of the key demands. All power to the plenums? Since the protests started, plenums have been established in a number of cities. They meet to discuss and to formulate demands. They are nothing like the plenums that we know from student protests in other parts of western and southern Europe, where discussions tend to go on forever, without decisions being made. These are structured, planned, prepared, and have a clear agenda. Everybody can speak, but only with short interventions. In the plenum at Tuzla city, decisions are not taken immediately; proposals of the working groups are presented, then other things are discussed and decisions are only made at the next plenum to give time for more developed discussions in the working groups. So far, these plenums have developed in more than 10 cities representing most of the cantons of the Federation. The plenums of different cities coordinate, meet and only go into negotiations with state representatives in accordance with the other plenums. But they are not like the soviets that developed in the Russian Revolutions in 1905 and 1917, which were mass democratic councils of workers and the oppressed, usually made up of elected delegates, that formed the basis on which the working class, led by the Bolshevik party, was able to take power. Nevertheless this movement has enormous power, with regional and local governments having already stepped down like the canton governments of Tuzla, Una-Sana, Sarajevo and Zenica-Doboj. The power is – or maybe for some days was – literally lying on the streets or with the plenums. There were elements of dual power developing, where the former state and regional authorities no any longer held full control and were losing power and the movement on the streets, as well as the plenums, had the potential to develop and to struggle for power. But as no further steps were taken by the movement the pendulum has swung back to the ruling class again. One of the organizers behind the plenums explained that they do not want to do the dirty work of the government(s) by sending people from the plenums to run the government’s agenda. A correct point regarding participating in pro-capitalist governments, but no alternative strategy was put forward. At the moment, the plenums discuss and vote on a number of demands – mostly against corruption and for a reverse of the privatizations. New candidates for government positions come to the plenums to present themselves, but they are largely picked by the old elite. Bahrija Umihanic, professor at the School of Economics, small business man and candidate for chief executive of the Tuzla Canton Government, went to the Tuzla Plenum. He presented his “programme” and people could comment and ask questions which he had to answer. Some were happy to see an alternative to the politicians they already know are corrupt. But many had the feeling that he was just another one of the same type, not representing their interests. Others try to lobby for their friends or for themselves to be put forward as a candidate. We met one, a professor at a technical university, who wants to be a minister for energy and proudly lists his academic title. It seems that developments are bringing individuals to the surface that simply want to get their piece of the corruption pie (because of the Dayton Agreement process at the end of the civil wars, there are 13 regional governments and over one hundred ministers, so there are many well-paid positions). This shows that the plenums and many of those who participate still work within the framework not only of capitalist logic, but of formal bourgeois democracy. They do not put forward a concept of an alternative system of rule, but at best this means they aim to fill the existing structures and government bodies with ‘better people’. Thus they could end up with a “state reform” that reduces the number of administrative bodies, ministers and other functions but does not change the system, as such. The plenums have strength and weaknesses. Their main problem is that they have no strategy for what to do next. As long as the movement is strong and there are mobilisations on the streets or in the workplaces, the ruling class has to react and even give some concessions. But when the movement reduces itself to discussing and putting forward demands without the ability to put pressure on the ruling elite to fulfil them, then the plenums can become a barrier. Already the social composition has changed. The plenums are not delegate bodies of elected representatives from workplaces and districts, they are open to anyone who wants to attend. They are dominated by people aged 35 years and over, with hardly any youth taking part. And although there are working class people and trade unionists around, the biggest group seems to be academics. They have a conscious orientation towards the working class and come from a left background, but the working class itself is not the dominant force. The Left is also present but hidden. Political organizations are not officially part of the plenums; the idea being to keep representatives of the ‘established’ parties out. But they are there anyway, just remaining hidden. And many of the participants are members or activists from several Left groups. When we spoke to bring greetings from the CWI and pass out our leaflets, we were a little bit worried that an “anti-organization” mood could be a problem. But nothing like this happened. We were welcomed; nearly everybody took our material and our speech lead to a number of positive reactions. There is a strong anti-party mood but this openness showed the wish for international solidarity and socialist ideas and also the understanding, that not all parties/organisations are the same. It might be that by not intervening openly Left forces on the ground fail to build organised forces for the next wave of the struggle. Only two young men criticized our leaflets for calling for democratic socialism. But they were obviously from a far-right/nationalist background and they spoke positively about nationalist and neo-fascist forces active in Ukraine. But some of their points hit home and they are not alone with their criticism of the development that the movement has taken. The plenums and the political forces leading them (although officially there are no leaders), shocked by the violent clashes, have put an emphasis on the plenums instead of mobilisations on the street. There seems to be no idea about a strategy of escalating the struggle, of next steps to take if the ruling class and its political representatives do not fulfil the demands of the plenums. Also we saw no obvious signs of mass political campaigning; we saw no leaflets, invitations to meetings and no papers of political organisations. The only posters put up in Tuzla are from the nationalist far-right. The lack of financial resources can only be one reason for this lack of material. The representatives of Left organisations that we met have all taken part in the movement, but without offering their organisations as a tool to spread the movement and to further discuss ideas. This reflects a cautious way to intervene, bending to the anti-party mood and not being confident to explain why socialist organisation is necessary to defeat capitalism, something which also reflects the lack of traditions of socialist campaigning over the last decades. The experiences of political organisations and their methods in the former Yugoslavia and then in the new capitalist Bosnia-Herzegovina have not helped to develop these traditions. This has the negative effect that no organized force intervenes in the movement. No next steps are really planned and the question of struggling to win power is not really discussed. This gives the ruling class the ability to wait and see what happens and hope for the movement to end by itself. This will not happen in the short run, as the social problems and anger at the corrupt elite is too big. If no real results are won, no concessions that go further than formal changes, then there can be a new wave of protests. The far-right and nationalist forces are already preparing for their chance. They consciously try to intervene in the plenums and they will be able to get support especially from youth, if they do not see results and there is no credible Left alternative. It is clear that the movement is not over. It has ebbed, but can explode any minute since the reasons for the initial outburst have not gone away. But the forces of the Left and working class activists have to intervene in an organised way, with proposals that are more than just demands. They have to deal with the hopes – or better illusions – in the EU. Bosnia-Herzegovina wants to become a member of the EU – it has signed a free trade pact – and also wants to join the WTO. People hope for investments from the EU, and following this, an increase in living standards. But the last 20 years of EU-intervention have shown that the European capitalists just want Bosnia-Herzegovina as a place to sell their goods and, in some cases, to be used for very cheap labour. Most of the privatised companies have not been invested in, but rather closed down to get rid of competition. Up to 90% of the banking sector is in the hands of foreign banks, giving them the possibility to invest their capital. Why should this change with a formal integration into the EU, especially given the difficult economic situation the EU countries are in? Left forces that intervene in the protest movement have to take up these issues and explain the policy of the EU in the rest of Europe, especially in Greece, Spain and Portugal. They have to make clear that capitalism can offer no future for the people of Bosnia-Herzegovina. Left forces have to put forward a programme of action that can help to win the demands of the movement and the plenums. This involves a programme and a strategy that can help to win over working class people and youth in the Republika Srpska (RS), as well. Up to now, there have been no major protests there. Although the social situation in RS is even worse, nationalist forces stop any attempt to organise protests. Activists that attempted to organise protests along similar demands as in Bosnia-Herzegovina have been harassed and threatened. A day of action in the whole of the Federation, with a call to the people in the Republika Srpska to participate, as well, could be a next step. Strikes in workplaces, schools and universities could be part of such a mobilisation, but the high rate of unemployment has to be taken into account. So it would have to concentrate on big companies and has to be combined with organizing flying pickets. Such a day of action and strikes could be supported on an international level with pickets and protests in cities where people from the Bosnian-Herzegovina diaspora live (who follow what is going on with enthusiasm) but also at companies and banks that are responsible for the plundering of the country. Companies that have not paid their workers for months could be taken over by workers, as a first step, linking up with similar workplaces in other countries, especially in other Balkan countries. Given the small size of Bosnia-Herzegovina the international outlook is of even greater importance. The need to link up with the struggle of working class people all over Europe and internationally is vital. The Bosnian diaspora follows events with great interest and is part of this internationalization already. It is crucial that solidarity develops a clear class position, linking up with the unions, shop stewards and working class activists. But it is not only a question of international solidarity. The problems that working class people face all over the world are, at root, linked to capitalism and its crises and the discussion about alternatives and the fight for them are taking place internationally as well. A lesson of the past is that although the overthrow of the system of capitalism – the root of corruption and exploitation and poverty – is possible on a national level, to ensure fundamental and lasting change of society, socialist transformation needs to take place on a an international level starting with the breaking of capitalism’s grip over the world economy. It is necessary to open a debate about an alternative way to run the economy – a socialist alternative. This needs to take up the experiences of Yugoslavia and the Tito-era, but also what has happened since. There is an enormous sympathy for Tito, with his picture being put up everywhere and a lot of positive references made about his rule in the movement. There needs to be an honest discussion about the reasons for the failure of the Yugoslavian model, including the top-down, bureaucratic rule that stifled the economy, the path to capitalist restoration and the development of nationalist tensions which were exploited by different sections of the ruling elite, the new capitalists and outside capitalist powers. And it is important to recognize that this process did not just start after Tito’s death. It was rooted in the Yugoslavian model of “socialism” that lacked real workers’ democracy, as was also the case in Eastern European states. A key factor in the breakdown of the “Yugoslav model” was, after the failure of its attempt to create to “socialism in one country”, was the opening towards capitalism which lead to economic crises in the early 1980s when real wages fell by a quarter alongside mass unemployment. All this has to be part of the discussion process that is opening up. The anti-fascist and anti-capitalist traditions are still relatively strong in Bosnia-Herzegovina. The experiences of disastrous civil wars in the 1990s make working class people aware of the dangers of reactionary nationalism and ethnic and religious divisions. This is does not mean that nationalism and dangerous nationalist divisions could not come back if the movement is unsuccessful and right wing forces are able to exploit the situation. But it is a tradition and experience on which new Left forces can build, fighting for a democratic socialist future for Bosnia-Herzegovina, as well as the whole of the Balkans, on the basis of struggling to overthrow capitalism and to create a democratic socialist federation, on an equal and free basis. Previous articleMarch 15 National Day of Action Huge Success!